ABOVE: The MS Maribelle in Chalon-sur-Saône, France. In the course of a week-long journey on the Saône and Rhône Rivers in Southern France, I learned what makes river cruising so different from ocean cruising--and why river cruises are increasingly popular with foreign visitors who want a more pleasant and less stressful alternative to escorted bus tours. With my 17-year-old son Anders Imboden, I enjoyed the convenience of unpacking and unpacking just once while exploring more than half a dozen cities and towns in a region known for vineyards, gastronomy, medieval castles, and Roman monuments. This 191-page cruise review includes a report on the ship and its crew, descriptions of ports and excursions, and 169 captioned photos of the MS Maribelle and its cruise itinerary from Chalon-sur-Saône to Avignon, France. Viking's Southern France itinerary and shore excursions may vary slightly from year to year, and the itinerary's name often changes, so check the Viking River Cruises Web site to learn what's included or excluded during this year's or next year's cruising season. 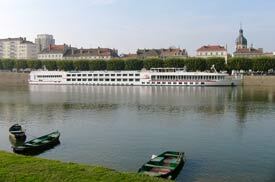 The last time we checked a few years ago, Viking had not just one, but three ships on its Southern France itinerary. The vessels are from Viking's new "Longships" series.